I can’t help myself. Whenever I see this Grinch Wine Cozy, I just want to break out singing “You’re a mean one, Mr. Grinch”…. What is it about that grouchy grinch that makes me smile? Maybe those grumpy eyebrows. Or that snarly smile. 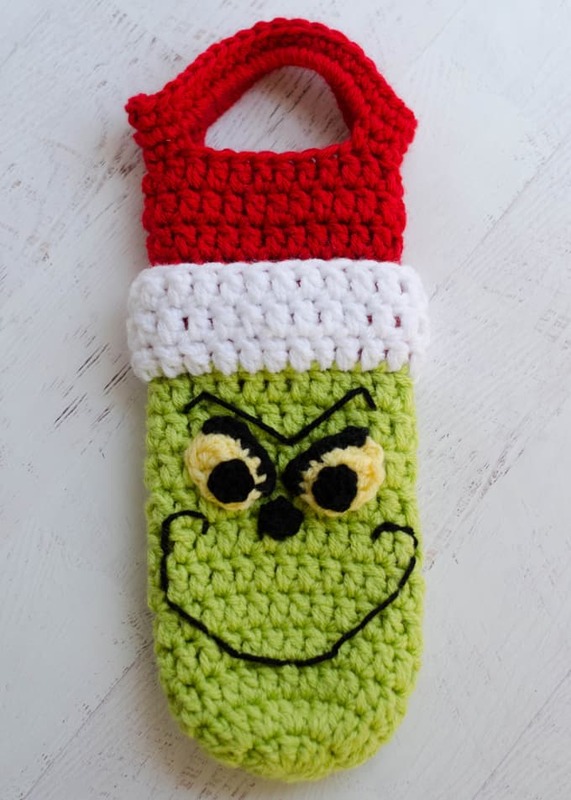 I’m not sure, but I sure am loving this Grinch wine cozy pattern! So maybe you’ve noticed… I’ve kinda been on a wine cozy frenzy lately. They are so easy to make and they make bringing a bottle of wine to a gathering extra fun. Plus they are fast to make so they are perfect for that last minute gift. It all started with the Fall Wine Cozy that I’m sure my dad looked at for all of 2 seconds before he pulled it off to pour us some wine for Thanksgiving dinner. And now we have 3 great cozies for the holiday season. Because not only is toting around a sweet wine cozy fun, they are fun to make as gifts too! First was the snowman wine cozy. My personal favorite and apparently yours too because it is all over social media! Thanks, guys! I love it when you make my patterns and tag me! Then came the Santa wine cozy (also a hit) and now THIS. This Grinch wine cozy is deliciously bad but in a decidedly good way. It’s my sister’s favorite and maybe it will be yours too. Lion Brand Vanna’s Choice worsted weight yarn in Radiant Lime, Scarlet, Black, White and Lemon. R1: Using 2 strands of Lime color yarn, make a magic ring, chain 3 (counts as 1st dc) 11 dc in ring (12 dc total). Sl St to 1st st.
R3-11: Ch 3 for 1st stitch, dc in remaining stitches (24 st) Sl st to 1st st. Change to Scarlet color in joining slip stitch of last round. R12: Continuing with Scarlet, Ch 3 for 1st stitch, then, working in the back loop, this round only, dc in remaining stitches (24 st) Sl st to 1st st.
R13-17: Continuing with Scarlet, working in both loops, ch 3 for 1st stitch, dc in remaining stitches (24 st) Sl st to 1st st.
R18: Ch1, sc in same st as joining and next 2 st, ch 14, skip 7 st, sc in next 5 st, ch 14, skip 7 st, sc in last 2 st. Sl st to 1st st.
With Lemon Color yarn, make a magic ring. In the ring work: ch1, 3hdc, 3dc, 3tr. Fasten off Lemon yarn, leaving a long strand for sewing. The piece should have a flat edge and a rounded part. The flat edge is the top of the eye, with the last triple crochet worked forming the top right side of the eye. Now you will work a row of single crochet with black on the top flat edge of the eye as follows: Attach black to the side of the last triple crochet worked. Work 4 sc in the side of the triple crochet, work 1 sc in the side of the first hdc, then rotate your work slightly and work 2 sc in the top loops of the same hdc. Zoom in on the photos if you need to; when you are done there should be a row of black on the flat side of the eye. The left eye is similar to the right eye, just in reverse. With Lemon Color yarn, make a magic ring. In the ring work: ch4 (counts as first tr), 2 tr, 3 dc, 3 hdc. Fasten off Lemon yarn, leaving a long strand for sewing. The piece should have a flat edge and a rounded part. The flat edge is the top of the eye, with the last half double crochet worked forming the top right side of the eye. Now you will work a row of single crochet with black on the top flat edge of the eye as follows: Attach black to top of the last hdc work. Work 2 sc in the top of the hdc, rotate work, work 1 sc in the side of the same hdc, then work 4 sc in the side of the starting ch 4 (which represents the first tr of the lemon crochet). Remember to zoom in on the photos. Remember, the goals is 1 row of 7 sc across the top of the flat part of the eye. With black, make a magic ring. Work 6 sc in the ring, sl st to 1st sc and fasten off. Leave a long strand for sewing. Sew nose in the center of rows 7 and 8. Referring to photos, sew pupils on to eyes. Position eyes slanting up over nose. Take time to make sure they are in the perfect position. 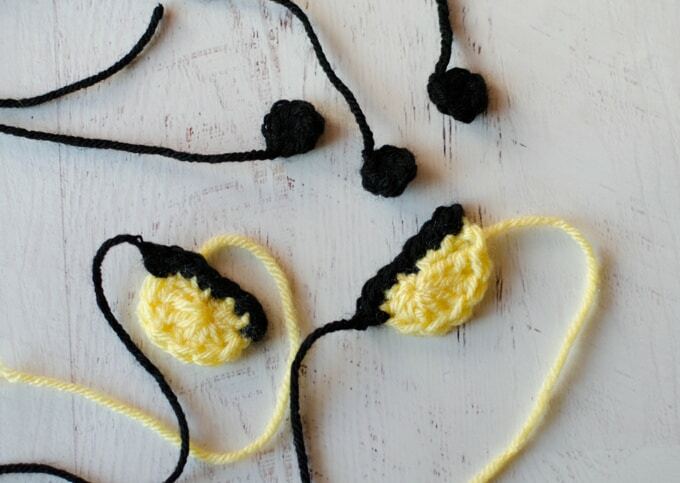 Sew down the eyes, using the appropriate color for each section (lemon yarn for lemon color area, black for black area). The eyebrows and mouth are sewn with black yarn using a back stitch. The eyebrows are two long stitches over each flat part of the eye and a short stitch angling over row 11 of the cozy. The mouth is what really makes the grinch, the grinch. It is easy backstitches again, but placement can be tricky. Here is what I suggest: Lay the wine cozy flat on a stable. Take a scrap piece of black yarn and carefully form a mouth with the curves, as you lay it on the Grinch’s face. Use straight pins to carefully pin the “temporary mouth” in place. Use this as a guide as you back stitch the mouth. Thread a needle with black yarn and back stitch a small section at a time, unpinning the “temporary mouth” as you go. If you loved this Grinch Wine Cozy pattern, be sure to check out the Fall Wine Cozy Pattern. And.. the holiday wine cozies: The Snowman Wine Cozy and the Santa Wine Cozy! Be sure to sign up for my weekly newsletter so you won’t miss a thing! I love seeing your finished projects! 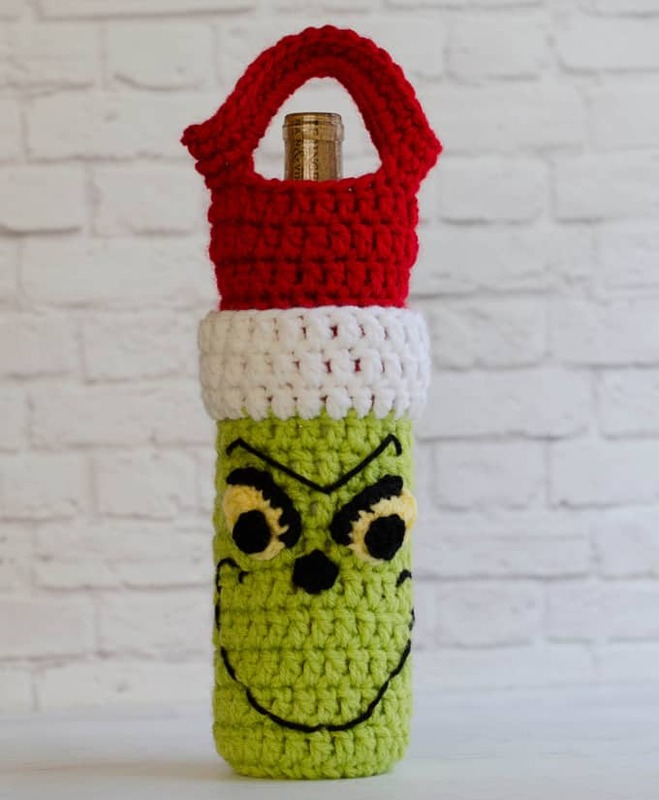 If you share your Grinch Wine Cozy on Instagram, be sure to tag me @crochet365knittoo. If you are on Facebook, stop over to the Crochet 365 Knit Too Facebook page and share a photo! I’d love to see your work! Written pattern copyright Cheryl Bennett 2017, all rights reserved. Please do not reprint or repost this pattern. If you would like to share this Grinch Wine Cozy pattern with others, just link to this page. To print or download without ads, use the Print Friendly button below or go to PrintFriendly.com. You can also copy and paste the pattern into your word processing software. If you’d like to make items for sale from this pattern, please visit my About page for more information. Thank you to Lion Brand for providing the yarn for this pattern. I love this. How cute and clever! Absolutely adorable. I love it. And to was an easy to follow pattern. Thank you for posting it. I love it! Thank you for sharing, I made one to give to my niece with a bottle of wine for Christmas. Glad you like it! I think the wine cozies are just so fun to make! Thank you for this pattern. It’s really great. I especially am grateful for the instructions on the eyes. I tried to make something like this before but I didn’t like how my eyes turned out. 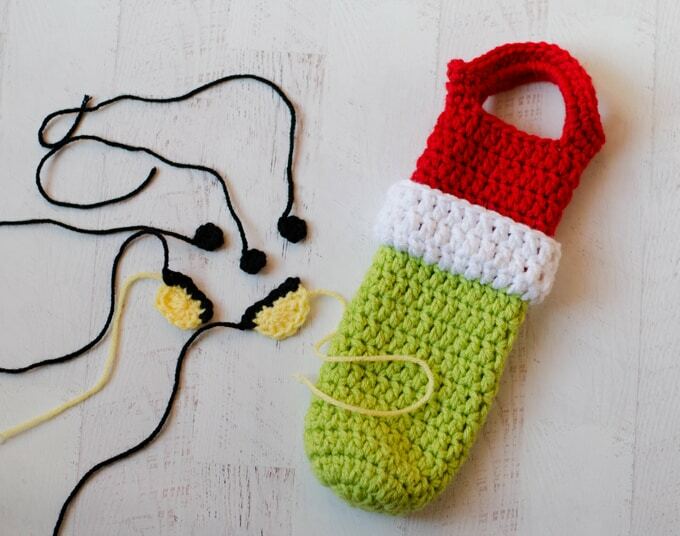 I have also used this to make a Grinch scarf and I am going to maybe do a child’s purse or pillow. One thing I did for the dc and tr crochet stitches in the eyes was I did them as “linked dc and linked tr crochet” stitches, which closes up the spaces between the stiches. It turned out really nice. I love the Grinchy poo, so it was a lot of fun to make something and get it right. So glad you liked the pattern and great idea on the linked stitches! How do you crochet into a free loop for the hat brim? Is it attached at the top also? If you look at this post on parts of a crochet stitch: https://www.crochet365knittoo.com/parts-crochet-stitch/ you can see that a stitch has a front and back loop. In this pattern, first you work with red yarn in the back loop only (just for the one round). Then, later, you come back with white yarn and work in the front loop. To answer your 2nd question, the brim layers over the rest of the “hat” portion and stays in place on its own without stitching down. Hope that helps! Love this. Been searching for awhile. Thank you for graciously sharing your talent.